No matter whether you’re an aspiring professional, a working musician, or a seasoned pro in a music band you can ascend your career by upgrading your online presence with one of the 11 best music WordPress themes for Jazz musicians. Establishing a well-marketed presence online through a music website is essential for any jazz musician to promote their brand, product, and business. The best WordPress themes for Jazz musicians with a music theme and responsive designs are created for a professional, personal, and memorable impact for your online community and in the music industry. Progression, improvisation, communication and adaptation—that’s jazz, man! Coincidentally, each of those attributes is also prudent in the business of jazz marketing and, let’s face it, being a world-class musician is great but that doesn’t pay the rent. Being a professional musician means becoming an entrepreneur and a product, all at once. One’s musicianship, or any kind of artistic craft, is the product but it won’t sell itself. Successful artists embrace the current progressive nature of communication through technological platforms and adapt to meet the professional standards of the industry. The benefits of using a jazz theme for your WordPress site will be instantly appreciated by your online viewership and can result in a significant increase in website traffic. The first Jazz musicians WordPress theme on the list is available as a free-to-download theme and is compatible with mobile devices and tablets. Perfect for jazz musicians that are new to the online marketing world, as well as early-career musicians that need a website upgrade, Jazz is the best free WordPress theme for Jazz musicians. With an intense aesthetic and an easy-to-navigate interface, Jazz conveys an impression of charm and intrigue. Featuring a design palette of green, gray, and black the Jazz WordPress theme captures the eye immediately. It comes fully customizable and can be redesigned with a few clicks. It may not have as many custom options as some of the other choices on our list but what it lacks in quantity, it makes up for in its clean, striking design. The Jazz WordPress theme is engineered with a framework to easily and subtly configure your personal website. With the Dynamic Content Loader, administrators are able to load posts and new blog content, without reloading a page and content is uploaded to mobile and tablets automatically formatted accurately. The theme features many essential page add-ons and navigation tools, such as custom sidebars, social bars, a page translator, spam protection, and advanced editing options. The Jazz WordPress theme is a solidly inclusive starting place for any budding Jazz musician’s promotional website. 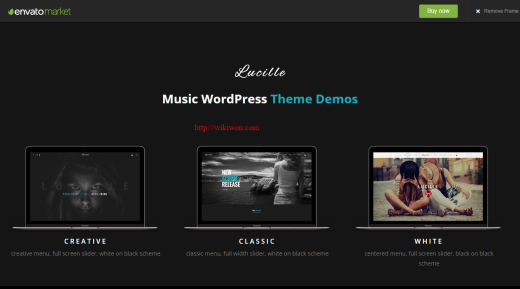 For those, looking for a WordPress theme with more intensity and customization, the Lucille WordPress theme is one of the best for Jazz Musicians in a young career on the rise. Lucille is made for the musicians with a strong presence and a need for a platform to convey their energetic artistry adequately to an online audience. With a high level of custom options and theme template choices, Lucille is great for jazz musicians at every level of musical practice. Designed to offer mobile platform adaptability and a choice in base color of black or white, the Lucille WordPress theme for jazz musicians creates a subtly piercing visual effect, regardless of the viewing platform. Administrators can customize blogs, fonts, colors, icons, pallets, and more. The Lucille Theme uses single images as backgrounds, which gives users a direct, effective visual message. Lucille gives your jazz business a brand design of your choosing. It is striking, direct, and poignant. The Lucille WordPress theme incorporates a visual composer in the content creation and customization of its pages. Thanks to the WooCommerce plugin, musicians can offer an online store for selling concert tickets, music, posters, apparel, and more. Administrators are able to upload schedules for concert tours and performances that are viewable on the website’s landing page, via the calendar feature. Most beneficial of all, the Lucille theme is built to handle the best-quality song files, high-definition sound, and professional recordings. 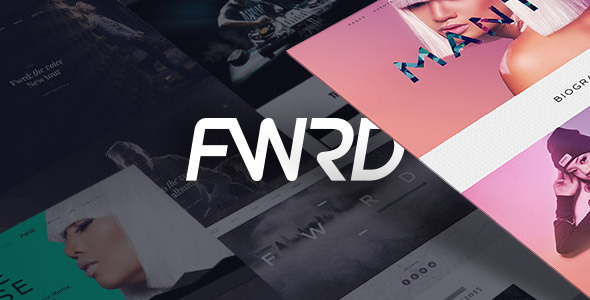 FWRD is a Jazz Musicians WordPress theme that comprehensively brings intricate levels of detail and a masterful visual balance into beautiful harmony. This WordPress theme allows the jazz musician with talent, class, and style to showcase the spirit of their music, along with the sounds of their soul. A high-quality design and extremely usable platform make FWRD perfect for seasoned Jazz pros with a high-class flare. The FWRD design is fully compatible with all viewing platforms, such as smartphones, iPads, and Android tablets. FWRD is great for artists because the software design is mindfully written to showcase the utmost quality of a musician’s work portfolio. In addition, it is designed to incorporate full music videos and live image backgrounds for a full aesthetic immersion on the part of the viewer. Upon arriving on the FWRD landing page, users are greeted by a crisp background image, as well as an intuitive navigation setup. Administrators can choose between five different FWRD templates with The Voice being featured in the image above. Users can play songs and other audio files with the onboard Audio Player feature and it allows users to upload their own tracks, as well as to make playlists. Musicians benefit further from additional page features, such as the Lyrics and Review widget. With a full event calendar feature and WooCommerce plugin, users can view tour schedules and buy tickets—all within an all-inclusive platform. The Vice WordPress theme creates a vast, intricate landscape of creative potential for a musician’s website. Visitors and administrators alike will be inspired by the WordPress platforms versatility and malleability. Vice is a modern, accessible WordPress theme, which is perfect for jazz musicians looking to attract a millennial viewership demographic. In addition, its user tutorial videos benefit those with fewer WordPress skills, by creating an easy-to-follow, comprehensive video guide archive. 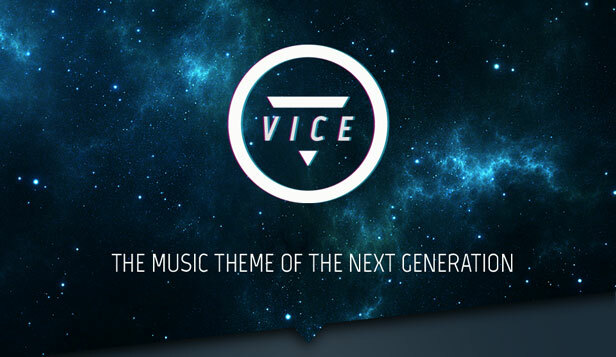 Whether it’s out-of-this-world acid jazz or classic, timeless jazz standards, Vice brings a musician’s music to life. With the ability to create as many multi-pages or as few single-page landings as desired by admin, the aesthetic possibilities are virtually limitless. Site administrators can even use a full music video as their landing page background, giving Vice the highest marks in visual customization. In addition to the 120 personalized icons and customizable background images, Vice features an auto-updated calendar tool so that users can buy a ticket or check dates and times of shows. Users to the site are also able to share posts, music, and show dates with one click, using the 2-tier drop down social menu of 25 social media icon links. Vice is a perfect WordPress theme for trending artists and hip jazz musicians with pizazz. Youthfully fresh and daringly elegant, Uncode is the best WordPress theme for Jazz Musicians who want to show off their creativity and style. Users benefit from a fast-loading landing page and a highly responsive interface, which will catch viewers and hook them. Offering a professional level of polish and specifications, Uncode is great for musicians looking to get their website up and running with minimal hassle. Uncode is designed with a highly intuitive customization and layout design interface, complete with Visual Composer, Revolution Slider, and Layer Slider plugins. Dozens of customized shortcodes expertly manage the intricate features that adorn the site’s content interface. Uncode provides an intuitive and efficient WooCommerce plugin for the marketing and sale of products and merchandise, straight from the Uncode WordPress site theme. It features the choice of thirty homepage demos, so administrators can easily pick from a multitude of pre-assembled, ready-to-publish templates. Administrators have the option to pick from several portfolio and blog style templates that cater to every style of jazz from Avant-garde to Orchestra jazz. Users will remember the up-and-coming jazz musicians best, who use the Uncode WordPress theme to their brand’s potential. Uncode is the best WordPress theme for getting a great portfolio online in a hurry. Featuring one of the most comprehensively unique arsenals of themes, plugins, and widgets, SONIK will act as a defining element of your brand’s image. Incorporating a youthfully colorful pallet and cutting edge musical interface tools, this multipurpose WordPress theme will cater to jazz musicians of all career levels and markets. 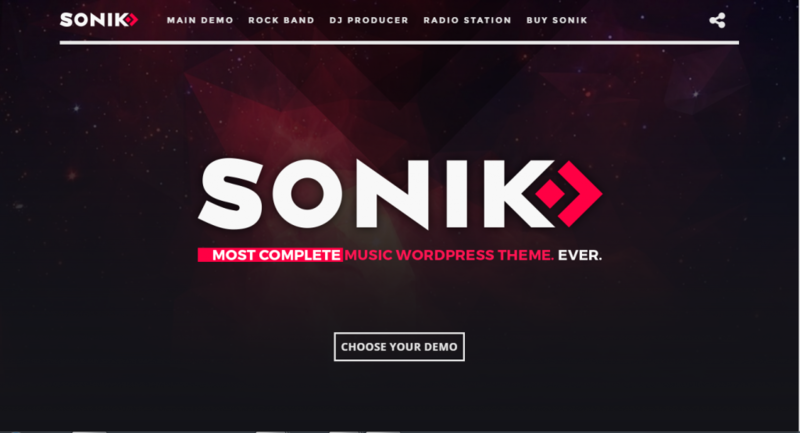 SONIK is one of the best WordPress themes for musicians who want to target their website to the music industry at large. SONIK is designed around an HTML5 framework and incorporates a high-functioning visual composer with drag-and-drop plugin builder capabilities. The SONIK platform is designed for users with any level of Internet website building acuity. It allows even the most inexperienced online practitioner to easily and effectively take control over the design of a professionally suitable, jazz musician’s website. From a one-click template demo to the full customization ability, SONIK gives users complete control over the impact of their WordPress website. It is conducive to those who wish to showcase a library of work with its advanced native features, such as a SoundCloud widget, MP3 Streaming Music Player, and Podcast Widget. Users can upload music files directly from their SoundCloud account, feature performance dates with the Calendar tool, and sell merchandise with the WooCommerce plugin. An all-in-one offering which is simply innovative for the jazz musician that stands out from the crowd. Perfect for the aspiring garage band, solo youtube singers, and back-alley jazz musicians, Colibri is a cheap and effective way to put yourself on the web map. Though it does not include some of the higher end features, Calibri is great for up-and-coming jazz musicians who rely on social media for patron viewership and support. 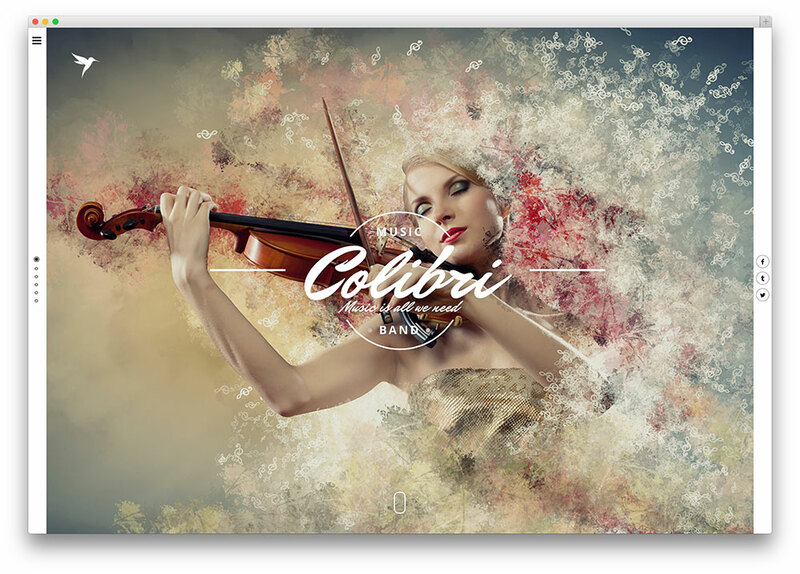 Colibri is one of the best WordPress themes for jazz musicians who want to utilize Twitter, Soundcloud, Instagram, and BandsInTown in their WordPress website interface. The clean and simple aesthetic is perfect for a highly user-friendly page creator. Designed as a versatile web page construction medium, Colibri features many landing page building options, tools, and add-on capabilities. And for the musician who prizes minimalism, Colibri gives the perfect layout of one-page design templates for the minimal amount of time spent on site creation. Users benefit from the Redux Framework admin panel, which provides administrators a powerful, intuitive user interface. The customization tools on Colibri are accessible to all users, regardless of their background in website design. Admin is able to integrate a calendar feature, e-commerce plugins, and customize page backgrounds to feature an unlimited number of images and color pallets. For the jazz musician who likes to spice it up, Tango theme is the best WordPress theme for those who have an insatiable zest for music. 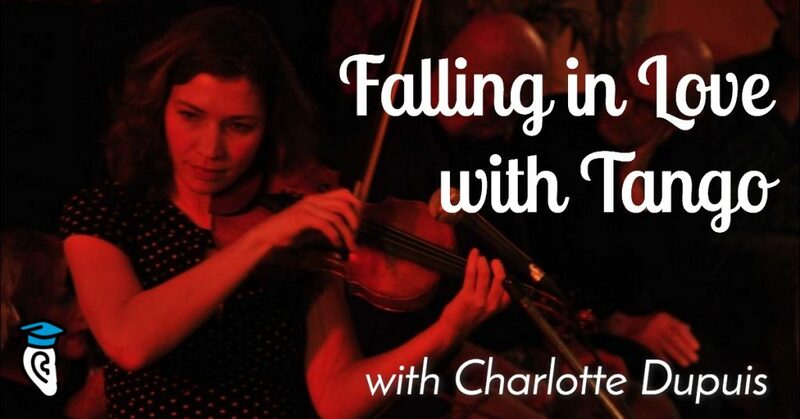 Tango is perfect for the jazz musician whose art focuses on dance and physical expression. 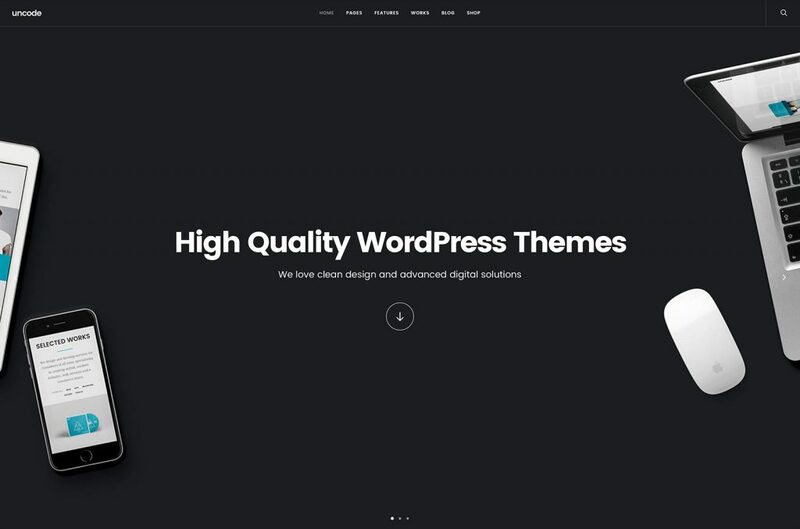 Bloggers and designers alike will love the usability and design of this premium WordPress theme. Tango incorporates less color customizability than some of the others on the list, but, what it lacks in choice, it makes up for in specified aesthetic quality. This WordPress theme is designed with a black and blood orange color scheme, which accentuates the fiery, passionate energy of the musician’s persona. Tango is the best free WordPress theme for musicians in the Latin jazz genera. Tango creates a visually stunning experience for users, allowing for the customization of 3D image slideshows. Highly responsive and includes all of the fundamentals, such as a landing page calendar tool, blog widgets, and an e-commerce plugin. Tango caters itself to the sizzle of salsa and the Latin jazz niche. Tango is the best Latin jazz-themed WordPress plugin for musicians of that focus. For a multipurpose musician’s website, Croma offers a colorfully-expansive, technologically-flexible and feature-rich WordPress theme for jazz musicians. 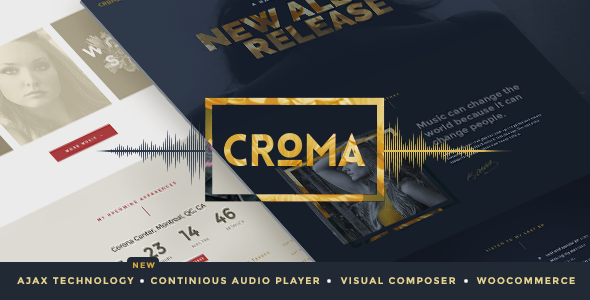 Capable of the highest professional standards in musical integrity, the Croma WordPress theme offers feature-rich tools and user-friendly controls. Croma appeals to jazz musicians of any skill level and background. Designed to appeal to a large online viewership base, Croma offers the best audio player capabilities on the jazz musician’s WordPress theme market. The site is designed to have a wide array of options within a classy, straightforward context that does not distract from the music. Croma is designed to focus the attention of viewership on the musical quality of the jazz and is fully HTML5-powered. Administrative users have a wide array of interface creation options, including creating customizable playlists and other musical management options, such as page event calendars. The powerful event manager plugin can even sync with a musician’s tour schedule to assist in the organization of timetables around gig dates. Croma is a great WordPress theme for any jazz musician who is working professionally in the industry. One of the most modern WordPress themes for jazz musicians, Musisi is best for young guns and those who are ready to make waves in the jazz industry. A highly-stylized, elegantly-electric theme, Musisi serves to bring in a young audience and capture the imagination of its viewers. Featuring all of the necessities of a professional jazz artist, Musisi is a one-stop-shop for one of the best WordPress themes for youthful jazz musicians. Musisi is designed for website builders who don’t want to obsess over every little detail. The intuitive user interface allows administrators to design and customize the template which fits their jazz the best. Great for musicians who are playing many live jazz performances, the Musisi live calendar informs your fans of upcoming events and shows. 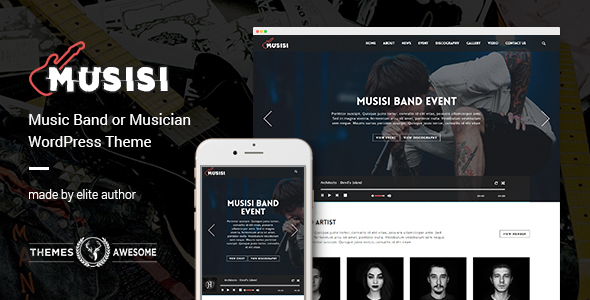 The Musisi WordPress theme is specifically designed for musical promotion and online visibility with one-click social media sharing options and automated subscriber notifications. An easy-to-use interface and intuitive navigation features make Musisi an almost effortlessly stable website. It is conducive for a low-maintenance user base but will support HTML5 music videos and high-quality audio files. For administrative users, the integrated SEO optimization feature will greatly increase online viewership and puts Musisi on the list of the best WordPress themes for jazz musicians. 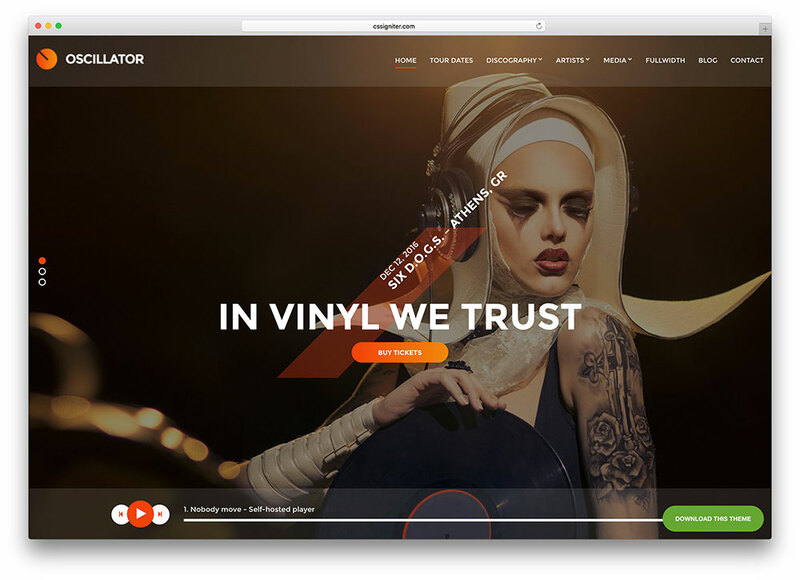 For a jazz-themed WordPress site that caters to the electric funk in us all, Oscillator comes in last—but certainly not least—in the best WordPress themes for jazz musicians. Endlessly creative and easily malleable to your individual flare, Oscillator offers a modern attractive design. Its list of featured tools, plugins, and widgets serve to make Oscillator the most unique WordPress theme for jazz musicians on our list. stylish and elegant, modern, and conceptually unique responsive WordPress musical multipurpose theme, a spectacularly flexible theme that has been thoughtfully put together with the utmost care, in order to produce a polished and spotless theme with marvelous, sophisticated musical capacities out of the box that can be endlessly customized to suit the needs of all sorts of music and entertainment industry related websites and peculiarly powerful as theme for musician websites, band websites, performer websites, and all related fields. Designed for the most flexibility and manipulation out of any on the list, Oscillator is made for the jazz musician who doesn’t fit the mold and doesn’t want to. It features a stylish, elegant, easy-on-the-eye design with a full array of integrated tools. Administrators can easily let fans and subscribers know about upcoming shows with the onboard event calendar and users can book tickets and buy merchandise thanks to the WooCommerce plugin. Users can utilize the streaming audio player for uploading their best tracks and benefit from the easy-to-use drag-and-drop tool. The homepage editor has a huge amount of customizable options, ranging from multi-page landings to floating text widgets and more. 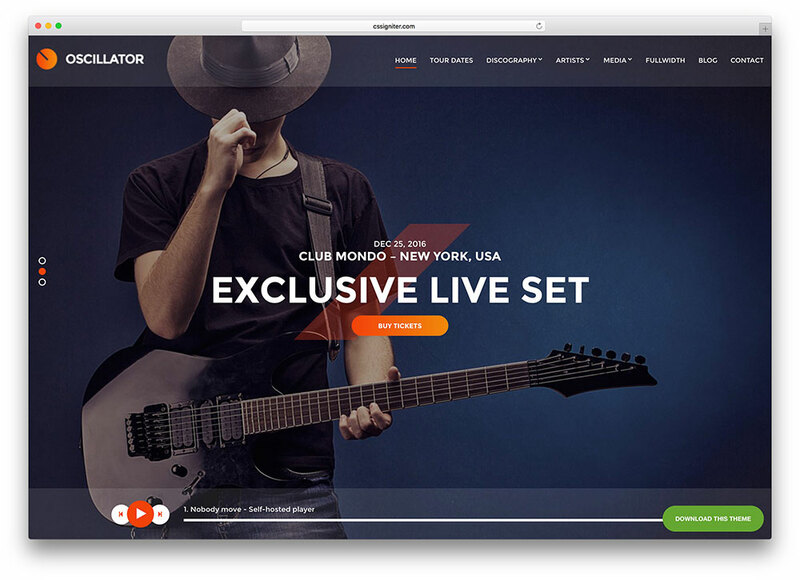 With six usable post types, musicians will seamlessly become master administrators of their WordPress theme with Oscillator. It is a great WordPress theme for jazz musicians looking for something exceptionally different.